While it might sound a little out of the ordinary, eating dinner leftovers at breakfast is an easy way to cut down on food waste, save money, and start your day with a well-rounded meal. Traditional breakfast foods, like pancakes, pastries, and bars, can be packed with added sugar, while traditional dinner foods, like protein and vegetables, are much better for waking up your metabolism and restoring your energy. Because rice can fill you up quickly, there's often some leftover at the end of a big dinner. Instead of simply tossing it, transform it into a delicious morning rice bowl. Simply heat up your leftover rice, and season it with salt, pepper, or hot sauce to taste. For a dose of morning protein, cook an egg to you liking and add it to the dish. If you're working with plain, unseasoned rice - or a different grain, like quinoa - Prevention magazine recommended making a sweet grain bowl. 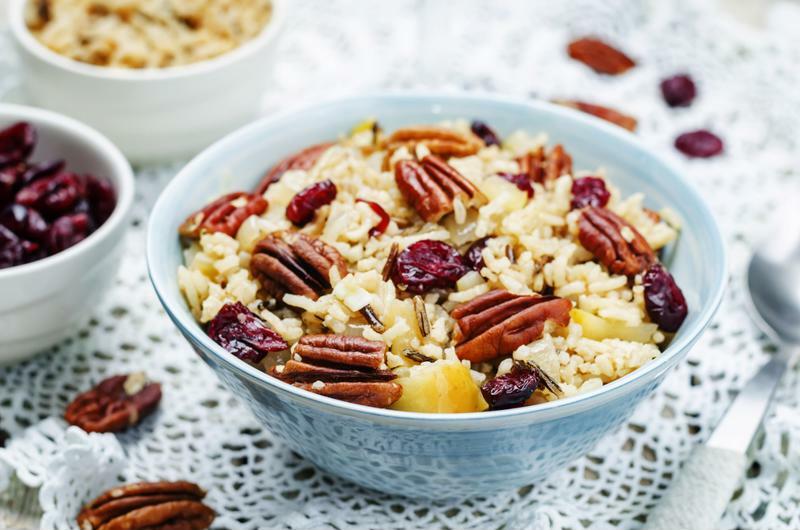 After you've warmed your leftover rice, flavor it with your choice of milk, nuts, honey, maple syrup, cinnamon and fruit. You'll be surprised how nice rice tastes when served sweet, not savory. For a vitamin- and mineral-packed breakfast that your family will love, simply combine last night's vegetables with your favorite style of egg. Reheat your veggies by sauteing them in a pan, then whip them into an amazing omelet or a savory scramble. Kick any vegetable-egg combo up an extra notch by adding meat, plant-based protein, seasoning, hot sauce and cheese. No matter what type of produce you served for dinner, it's bound to taste amazing when served with eggs the next morning. Adding fruit and nuts to leftover wild rice can make for a filling and delicious breakfast. Cook up a big Italian dinner without worrying about waste - simply use the extra ingredients to make pizzas for breakfast. The Huffington Post recommended using leftover sauce, meatballs, and cheese to craft mini personal pies on English muffins. Simply customize the pizzas using whatever you didn't finish the night before, and bake until the cheese melts and bubbles. An unexpected yet delicious way to re-purpose dinner foods for breakfast is by adding them to your morning smoothie. Plenty of items that you'd typically prepare for dinner, including beans, kale, sweet potatoes, cauliflower, butternut squash and spinach, blend nicely with fruit, ice, yogurt and/or milk to boost the nutritional value of smoothies. This method of using leftovers works best when you cooked the vegetables using little to no seasoning. If you plan to add dinner leftovers to the next day's smoothie, make sure to freeze the ingredients you want to use. Breakfast hash is one of the most popular ways to make sure dinner foods don't go to waste. While hash is often made using corned beef and potatoes, it can be cooked using any type of meat and vegetables you have on hand. To make quick, simple hash, Prevention magazine recommended chopping up your ingredients into tiny pieces, and frying them in a skillet that's been greased with oil or butter. While there are no limits to the different types of has you can concoct, Prevention suggested incorporating onions, carrots, sweet potatoes and peppers.